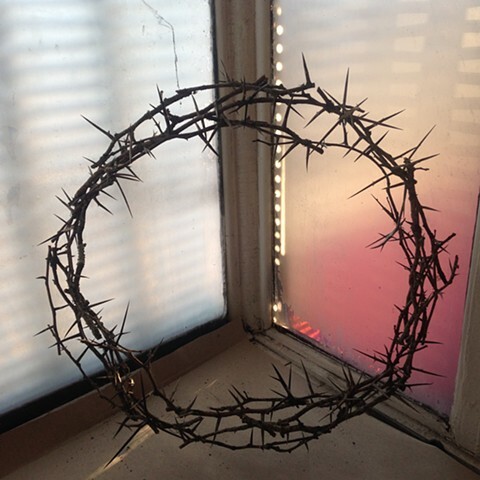 Crown of Thorns for Mammoths (Missing You) is created from the carefully bent branches of a Honey Locust (Gleditsia triacanthos), a species of tree in the legume family which puts considerable energy into growing 5 inch thorns well above the height of any browsing deer. The trees do this to protect themselves from the aggressive browsing of mammoths and mastodons—now extinct, due at least partly to over-hunting by human beings. Our forests have changed irrevocably since the loss of these elephantine megafauna—who not only drove evolution in other species, but also shaped the environment around them as ecosystem engineers. To long-lived trees, 4,500 years (perhaps 18-25 generations) since the last mammoths disappeared is but a moment; they took no notice.